Pussimbing Tea Estate has a history dating back to the early 1900s almost similar in time when this Lohia tea group was making a foray into tea business in the 1916s. The name Pussimbing is derived from a local dialect (Lepcha) which means ‘an area enclosed with plenty of streams’, and suitably so, as it is combed by a myriad of sparkling fresh water streams snaking down the hilly slopes of the tea estate. Pussimbing Tea garden is currently managed under the able guidance of the Lohia Group which had forayed into tea business in the 1916s. This group also manages 5 tea gardens of repute from Assam and a total of 13 tea gardens of Darjeeling which are considered as the top tea producing regions of Darjeeling. Some of the tea estates from Darjeeling under the Lohia group are Chamong Tea Estate, Tumsong Tea Estate, Lingia Tea Estate, Soom Tea Estate, Nagari Farm Tea Estate, Marybong Tea Estate, Dhajea Tea Estate, Phoobsering Tea Estate, Bannockburn Tea Estate, Takdah Tea Estate, Ging Tea Estate and Sri Dwarika Tea Estate. Pussimbing Tea estate is located in the western slopes of a small town named Ghoom, about 8 kilometers from Darjeeling town flanked by Dooteriah Tea Estate and Kalej Valley Tea Estate in the south. This tea estate is spread across the mesmerizing slopes of this small hamlet starting from 4500 feet to as high as 6000 feet, and also making it as one of the high altitude tea estate under the Lohia Group. The Lohia Group has the motto and commitment of ensuring the best and eco friendly products to its customers and in keeping with that spirit, this tea estate, like with other tea estate, was converted to a 100% bio organic in the year 1994. 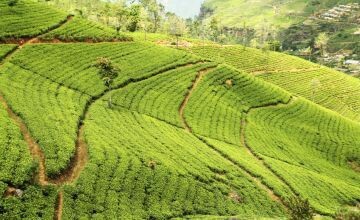 Now, all teas manufactured from this tea estate is certified 100% organic from IMO Control, Switzerland. Apart from this, this tea estate is also has a Fair Trade Certification from FLO-CERT GmbH, Bonn, Germany. Pussimbing Tea Garden has a good percentage of china variety bushes along with a mix of good quality Assam hybrid varieties of tea bushes. This tea estate is known for producing some of the very best and finest first flush teas of Darjeeling mainly from the china variety and not to mention a good percentage of fan following for its second flush black teas as well, raving for that captivating musky aromas in their cup. One favourite division that needs mentioning is the Minzoo Division which is famed for its exquisite top graded specialty Darjeeling teas.